Introduction : Laparoscopy is now established as a surgical treatment of choice for many abdominal problems. 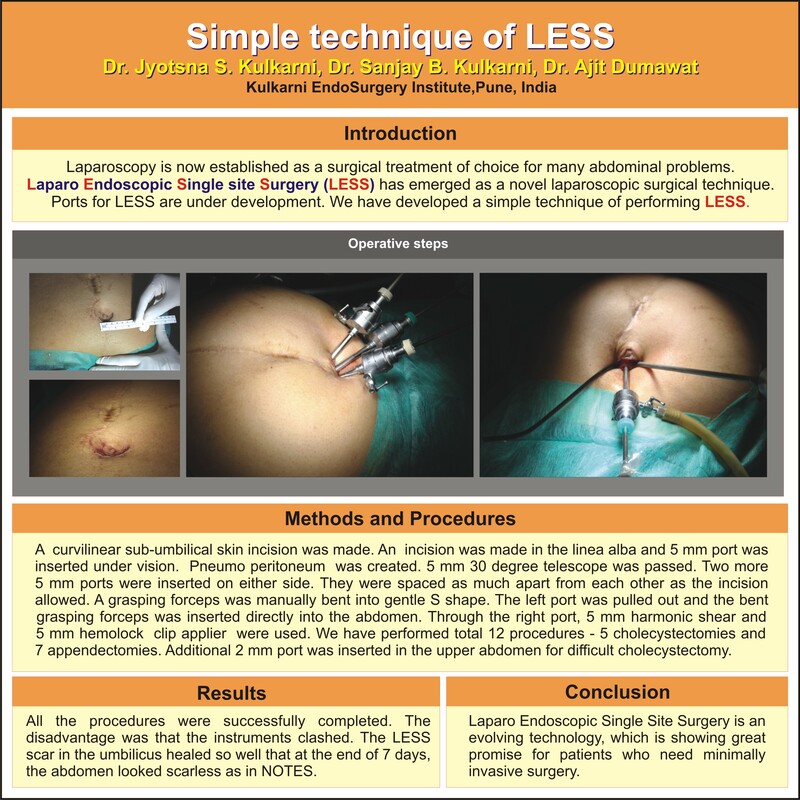 Laparo Endoscopic Single Site Surgery (LESS) has emerged as a novel laparoscopic surgical technique. Ports for LESS are under development. We have developed a simple technique of performing LESS. Methods and Procedures : A curvilinear sub-umbilical incision was made. An incision was made in the linea alba and 5 mm port was inserted under vision. Pneumo peritoneum was created. 5 mm 30 degree telescope was passed. Two more 5 mm ports were inserted on either side.They were spaced as much apart from each other as the incision allowed. A grasping forceps was manually bent into gentle S shape. The left port was pulled out and the bent grasping forceps was inserted directly into the abdomen. Through the right port, 5 mm harmonic shear and 5 mm hemo clip applier were used. We have performed total 12 procedures – 5 cholecystectomies and 7 appendectomies. Additional 2 mm port was inserted in the upper abdomen for difficult cholecystectomy. Results : All the procedures were successfully completed. The disadvantage was that the instruments clashed. The LESS scar in the umbilicus healed so well that at the end of 7 days, the abdomen looked scarless as in NOTES. Conclusion : Laparo Endoscopic Single Site Surgery is an evolving technology, which is showing great promise for patients who need minimally invasive surgery.